Democratic front runner is first of presidential candidates from either party to accept AIPAC's offer to feature at pro-Israel mega-event. Democratic presidential front runner Hillary Clinton is the first presidential candidate from either party to officially accept an invitation to address the upcoming AIPAC Policy Conference next week. The Conference will be held in Washington, D.C., from 20-22 March, and organizers recently extended invitations to each of the Republican and Democratic presidential candidates. Clinton, who last spoke at AIPAC in 2010 when she was Secretary of State, confirmed her attendance on Wednesday. 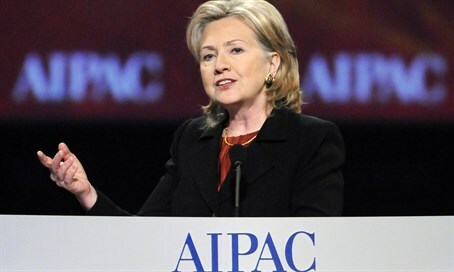 "AIPAC is pleased to announce that former Secretary of State and Democratic presidential candidate Hillary Clinton is confirmed to join us live at AIPAC’s 2016 Policy Conference," AIPAC said in a statement. "It is our honor to host presidential candidates this year, just as we have in previous election cycles." "Our Policy Conference is also likely to be one of the few venues that these candidates will have to speak to a bipartisan audience between now and Election Day," the email continued. "We are delighted for AIPAC to serve as the venue for presidential candidates to share their perspectives, and we look forward to welcoming them." Clinton's rapid acceptance of the invitation is a small but symbolically important move given last year's stormy battle between Israeli Prime Minister Binyamin Netanyahu and US President Barack Obama and his Democratic supporters over the controversial nuclear deal with Iran. Controversy between the two leaders erupted once again earlier this week, after it was revealed that Netanyahu had turned down an invitation to visit the White House and will not be attending AIPAC this year.